Does your little one love rolling around in the mud? When you give her dinner does she make a whole mess of things? As in, food thrown all over the walls, covering her face and hands kind of mess? Well then, we might just have the most adorable outfit for ya. 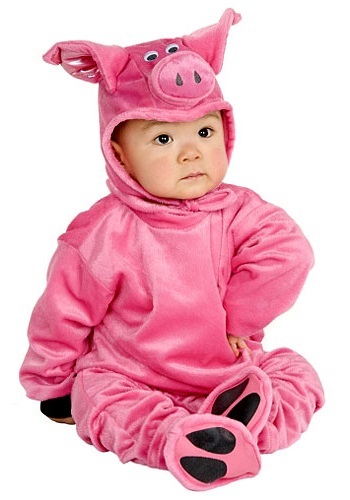 This Little Pig Costume will help your mess monster channel her spirit animal as she drags her muddy feet across your brand new carpet, or takes a fistful of those pureed apricots and tosses it at the TV on the other side of the room. But...on the upside, she’ll be very comfortable inside this pink velour outfit, complete with a curly tail, rib knit wrist cuffs and elastic ankles that stretch to fit. The jumpsuit itself ties behind the neck for comfort, and the hood comes complete with a picture-perfect soft-sculpted snout and embroidered eyes. And even if you’re going to the market, or deciding to stay home, the included booties, complete with printed hooves on the soles, will finalize her transformation into the cutest little piglet this side of the farmhouse. Now if only you can get her to sit still for a minute to take a picture. Let us know if you have any luck, we can’t make any promises there. This outfit might motivate her to wiggle and squeal with delight at her messy, wonderful world!